I’m on a flight from Seattle to Chicago as I write this, returning from the TDAA Judges Clinic and trial in Lynnwood, Washington. I get to be home for one day before getting on the road for Latrobe, the warm-up workshop, and the Petit Prix. We had a great clinic in Lynnwood. They were, for the most part, well prepared for the testing, and approached the work with palpable enthusiasm and electricity. The trial on the weekend was fun/interesting as well. They have a great community of players in that part of the world. They are very supportive of each other and dedicated to the prospect of having a bit of fun with their dogs. You gotta love it. We’ve made a Facebook page for our young rescue Cedar. Over the next couple of years I’ll share some of her foundation training on that page. I’ve got several recordings that I need to get up on the page. This is a busy time of year for me. I just need to make time. I was thinking about this up in Lynnwood. Back when I started doing agility about all of us were dog trainers. We ran agility out in an open park in the middle of the city with nothing but a thin flutter of plastic ribbon defining the sides of the ring. It was inconceivable that a dog would be out there with us who didn’t have a prompt happy recall. These days… we surround the agility field with impenetrable fencing, even to the extent that entry and exit gates are tightly shut. What happened to dog training? I want to share with you a discussion we had about Heinz 57, one of the games we played on the weekend. I had my own learning moment with the game. You may know that the tradition is to put the chute (doubler) at the front of the ring so that the handler can neatly finish with the doubler, score a point, and head to the table to stop the clock. During course review I was well on my way to pointing out this “tradition” when in virtually the same breath noted that the math could be very different with the chute at the back of the ring as the handler should reserve the performance of some obstacles (adding up to 57, of course) for the transition from chute to table. Obstacles can be taken twice for points. Back-to-back performances are not allowed. Another obstacle must be performed before the dog can be redirected back to an obstacle (whether or not it was faulted). The collapsed chute has a special value, it is a doubling obstacle, and can be taken twice, like any obstacle, and can be taken at any time during the dog’s run. No specific faults are associated with the weave poles, however, any error must be fixed or the dog will not earn points for that obstacle. With the exception of jumps, if a dog commits to any obstacle with all four paws he is required to complete the performance of that obstacle, whether or not it was faulted. A faulted obstacle may be repeated, but only after another obstacle has been attempted. In this course the dog getting on the table marks the finish of the course. The table becomes live after the dog has earned one point. The handler should exercise caution when directing the dog to obstacles near the table because if the dog gets on, then the game is over. Heinz 57 is scored points then time. 57 points is the benchmark. Any amount over or under 57 will be subtracted from 57 to determine the dog’s final score. This is part of a continuing series, Games of the TDAA’s 2014 Petit Prix. Today I’ll talk briefly about Snooker, a familiar game in our agility culture. The purpose of the Teacup Dogs Agility Association is to provide a competitive venue for dogs of small stature without regard to breed or pedigree, and to encourage course challenges that are comparable to the course challenges which face large dog handlers in other popular venues. So there you have it. There’s nothing easy about the TDAA. We have a high standard for performance and spacing between obstacles so that small dog handlers face the kinds of challenges that big dog handlers face on any given weekend of play… in the big dog agility organizations. Snooker is a two-part game. Each part is played and scored on a different basis. The objective of the opening sequence (the first part) is to score as many points as possible by alternately performing all of the red hurdles; and scoring points from the numbered sequence. The objective of the second parts is to run a short numbered sequence without fault. Time starts when the dog crosses the start line. Time stops when the dog crosses the finish line after the horn sounds or after completing the closing sequence. 12” and 16” dogs have 45 seconds; 4” and 8” dogs have 50 seconds. Opening Sequence: The game begins with an opportunity for the dog and handler team to earn points by successfully performing red obstacles, always jumps, valued at 1 point each. A successfully performed red earns the team the right to attempt one of the colored (non red) obstacles on the course, valued at 2 to 7 points. The team earns those points if the dog successfully performs the selected colored obstacle. This is a 4-of-4 red format. All four red hurdles must be attempted. When performing the combination obstacles, both obstacles must be attempted before going on to the next red or starting the closing. If the first obstacle of the combo is faulted, the dog must be directed to perform the second obstacle even though no points can be earned. In the opening all obstacles are bi-directional in; combination obstacles can be taken in any order or direction. 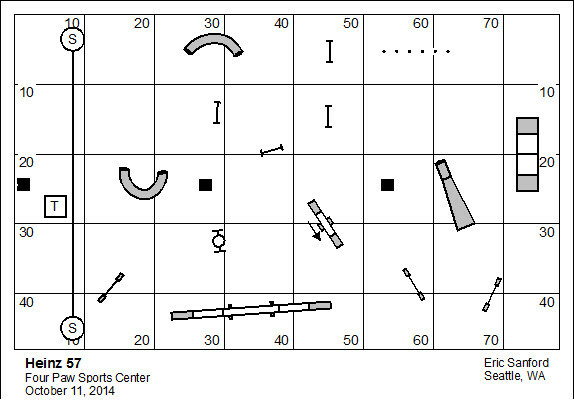 Closing Sequence: After the opening sequence, the team will perform all colored obstacles in the numerical sequence indicated by their point value (#2, then #3, then #4, and so forth, through #7). The dog and handler team will earn the value assigned to each of these obstacles as long as the obstacle is not faulted. In the closing, combination obstacles must be taken in the numbered order and direction. Snooker is scored Points, Then Time. There are old pilots. There are bold pilots… There are no old bold pilots. There are two essential strategies of this game: Flow and Greed. I’ve drawn here a basic/logical flow strategy. The circled numbers represent the value of the obstacles; the square numbers represent the intended sequence. I recognize that the wrap from the fourth red hurdle to the A-frame is a bit of a technical moment in the flow… but there’s nothing out there really for the dog to attack after that final red hurdle except for the A-frame. This course measures about 80 yards. Note that I’ve included the transition from the last “non-red” obstacle to the #2 jump because that is an important part of the puzzle. Note that in this strategy the dog will still have to do the first four obstacles of the numbered sequence to earn a qualifying score. Anything after that is gravy. There are other flow strategies that might be contemplated. It’s important for the handler and competitor to evaluate the strengths and weaknesses of his dog. Find something fast and smooth with as little technical churn as possible. And, where you can be a little greedy, what can it hurt? I had to share the old Chuck Yaeger quote above. I am always reminded of it when I thing about the “Greed” strategy. That being said, it is the greedy player who wins the game. I will not endeavor to draw a path for the “Greed” strategy. The greediest opening would be all four of the #7 obstacles. Inasmuch as the approach to the A-frame is a problem from the two red hurdles to the left… maybe these can settle for a performance of the #5 or #6 (a combination). Remember that if you do the #2 jump after your last red hurdle, you’ll have to do the #2 jump again to begin the numbered sequence. Let the judge be the judge. Don’t call faults on yourself. This is third in a series, taking a serious look at the games of the 2014 Petit Prix. Please note that B&D has extended the closing date for the Petit Prix. You can get a copy of the premium here: Petit Prix Premium. Gamblers is an old game in the dog agility world. I’ll present an example of Gamblers (a Teacup Dogs course) and then follow up with a discussion of strategy. The objective of Gamblers is for the dog to accumulate as many points as possible in a specified time and then to perform a designated gamble (sometimes called a joker), also within a specified time, which consists of a sequence of obstacles with the dog and handler working some distance apart. Gamblers is a two-part game: the point-accumulation period and the gamble period. The dogwalk is worth 7 points. The time allotted for the point-accumulation period shall be 25 seconds for big dogs; and 28 seconds for small dogs. Gamble period – Successful performance of the gamble is worth 25 points. Time for the gamble shall be 16 seconds for big dogs; and 18 seconds for small dogs. The dog exceeds the time allotted for the gamble period or faults a gamble obstacle. The handler steps on or over the containment line to aid the dog in performance of the joker. The dog knocks down a jump included in the gamble sequence during point accumulation, making correct performance of that jump in the gamble period impossible. The dog commits any performance fault during performance of the gamble. Be armed with a strategy that delivers enough points to qualify, and positions the dog near the start of the gamble with options for productive loitering. 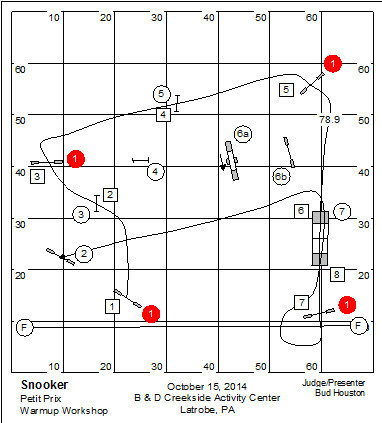 I’ve drawn on this course map a dog’s path that works the obstacles in the upper-right corner of this course. The line actually shows two performance of each of the obstacles in that corner. Be mindful of the rules of the game. First of all, the dog is allowed to do obstacles only twice. And, you should understand the rule about “loitering” near the start of the gamble. If you are running your dog in a circle over obstacles your dog has already taken twice the judge—with a mind like a steel trap—will likely call you for loitering and negate the dog’s gamble. So, you should take care to reserve the performance of the obstacles in your “productive loitering” strategy until it’s time for that strategy to reveal itself. If the dog already has the points to qualify (that’s what I said to do first, if you’ll remember), than chances are that the whistle will blow while working this performance of obstacles. But that’s the whole point. From anywhere in this corner the dog will have a good run at the opening jump of the gamble. Where you almost certainly don’t want to be is coming down the A-frame in the direction going away from the gamble. The gamble time isn’t really that generous. An important tradition in the Gamblers class is for the judge to give a higher value to an obstacle on the field. This is usually a technical obstacle, and typically gives a bonus of 2 points; so the 5 point dogwalk becomes a bonus obstacle worth 7 points. Note that the 7 Point Obstacle is typically one that has some risk associated with it. For example, it might be so far away from the start of the gamble that it becomes a timing risk. 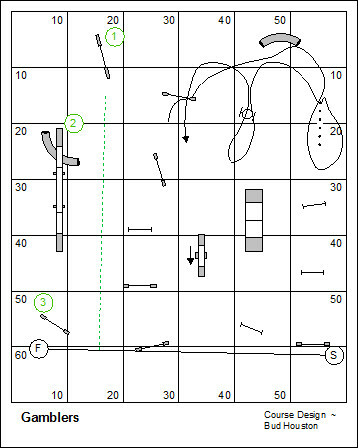 On this course map I’ve numbered an opening strategy that neatly picks off the 7 Point Obstacle. The plan avoids going anywhere near the two jumps that start and the gamble. We’ve already established that the dog isn’t allowed to do two gamble obstacles (one after the other). Dropping a bar in the gamble during point accumulation will also negate the gamble. So, stay away from those jumps if at all possible. This strategy delivers a qualifying score for the class. It would be fairly easy now to slide into the Timing strategy for the end of point accumulation that I described above. If your dog has a weakness, say on the teeter or in the weave poles you should not waste time with an optimistic reliance on the performance of those obstacles in the point accumulation period. Save that optimism for a standard class when performance of the risky obstacle is required, rather than optional. On the other hand, if there are obstacles on which your dog will demonstrate amazing speed and skill, these obstacles should be the centerpiece of your point accumulation strategy. For example, the dog might have an amazing running contact and so the A‑frame might be highly desirable during point accumulation. Turning a dog degrades the dog’s rate of travel. A good point accumulation strategy for the Gamblers class should not feature a lot of gratuitous technical movement. Instead, the canny handler will devise a flowing plan of attack that allows the dog to work at full extension and at his best speed. A notable exception to pure flow is the back-to-back performance. Obstacles like a pipe tunnel, the tire, the A-frame… maybe even the dogwalk are candidates for back-to-back performance. If you think about it, by turning the dog straight back you’ve made the transitional distance between obstacles negligible. Steal a second, earn a point. A dog is well directed by movement, even when the handler is at some distance. The handler should calculate his movement to give a steady signal to the dog, and give pressure to the dog to move in the direction of the numbered sequence. The gamble in the sample course above features a discrimination (two obstacles in close proximity) and the performance of a technical obstacle at a distance. Don’t be tongue tied as the dog makes his turn after jump #1 in the gamble. Give your command/verb for the dogwalk; Face the dogwalk; Point to the dogwalk; Move toward the dogwalk. And don’t step over the line. It’s nearly fruitless to try to describe what the handler should do to raise the chance for success in a Gamble. They are always different. A terrific strategy for success in Gamblers is to train your dog to work independently and at a distance. You are currently browsing the Bud Houston's Blog blog archives for October, 2014.